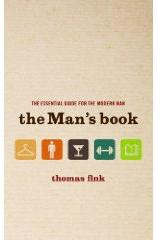 A new handbook is being released called The Man's Book: The Essential Guide for the Modern Man by Thomas Fink. This is a very comprehensive collection of manly and general knowledge topics. Each subject heading begins with humorous and appropriate quotes from various sources. Everything is covered in this book from first dates to liqueurs to knots -- hopefully not all needed on the same night! This book is also handy for girlfriends or wives or daughters with cooking conversion tables and cocktail recipes. The visual charts of beard types and hair loss patterns are hilarious! The only section I really had a problem with was "How to Start Smoking". Smoking is not manly, nor is it healthy. The Man's Book will be available on May 6, just in time to become a Father's Day present. Buy The Man's Book: The Essential Guide for the Modern Man on Amazon or find it at your local library.